When I first came across this quote, I copied it into my file titled, Quotes to Use in the Future. Most of the items in that file have languished there, forgotten. But this quote, this single paragraph, stayed with me and kept drawing me back. I have read and reread the quote many times and have come to the conclusion that it is a giant complaint, Muir venting about popular culture (sheet music), city life (the pine tree in the town square), and man’s indifference to the wonders of nature. This seems strange to me. While Muir had strong opinions in all of these areas, and while he had no problem expressing them, and while he sometimes verged on preaching and telling folks what they should do, it was not his usual style to vent, especially about everything all at once, in one long string of questions. Maybe it had something to do with the effects of his having lived in the Bay Area during this time, earning a living writing magazine articles. In any event, my interest has been stirred. So, in the next three posts I will take a look at these three sources of Muir’s annoyance. The period we are talking about is roughly 1870-1880, the post-Stephen Foster (d. 1864) era, and before Thomas Edison’s record player would become a household fixture. This was a time when sheet music was being churned out by the thousands, mostly by a group known as Tin Pan Alley. These were New York publishers, songwriters, and composers who virtually dominated the sheet music market. Sheet music had become big business during this time. The artistic cover designs appealed to the tastes of the growing middle class. 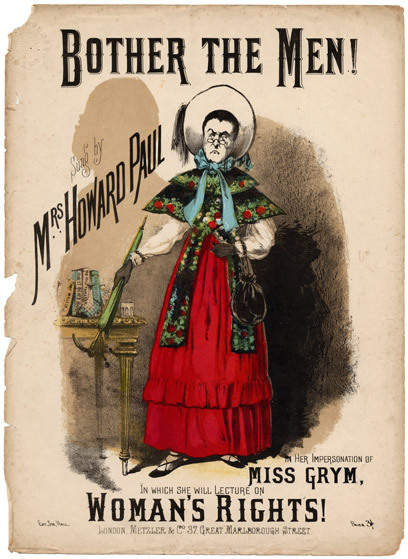 Parlor music, a form of home entertainment using sheet music, became popular, allowing people to sing their hearts out about things that mattered to them. The compositions dealt with topics of every kind, reflecting the complexity and richness of American life. War. Religion. Cowboy life. There were songs about love and temperance, prairie life and mining. A song titled The Mill is Closed speaks of the logger’s plight. The song, Should Women Vote?, enabled women to make a statement about their civil rights. In 1874, J. L. Truax composed Falling Waters, a piece of sheet music that is supposed to depict the sound of waterfalls – thus the title. The piece sounds classical, rather than purely popular. Perhaps that is because it represents an abstract theme – cascading water – as opposed to something more concrete, like lassoing a horse or marching to war. The question raised by Muir in his 1875 lament, Who publishes the sheet-music of winds, or the written music of water written in river-lines?, seems to imply that he was unaware of the existence of Truax’s piece. One wonders whether his statement would have been tempered a bit, had he heard it. Possibly not, as his complaint seems to be about the popular culture that surrounded the sheet music and not the music per se. Here is a YouTube performance of Falling Waters. In 1993, in an article in the New York Times, naturalist Natalie Angier wrote, Even the most elite human athlete is thoroughly pathetic compared with nature’s other aerobic masters. She goes on to give examples: the cheetah’s seventy miles per hour sprint; the hummingbird’s twenty-four hour migration vigil powered by wing beats of thousands per minute; the pronghorn antelope’s ability to maintain runs of sixty miles per hour over long periods of time. We enjoy these comparisons. It’s also fun to compare the records of elite Olympic athletes to animals’ skills. The Sprint: The Jamaican runner, Usain Bolt, 27.4 miles per hour vs. sprinting animals, the cat at 29.8 to the Cheetah at 61 miles per hour. The Lift: Soviet/Belarusian weight lifter, Leonid Taranenko, 586.4 pounds vs. the elephant, 661 pounds. Swimming: Brazilian swimmer, Cesar Cielo, 5.34 miles per hour vs. water animals, 22-80 miles per hour. These are impressive numbers for both the humans and the animals. What is missing in these comparisons, however, is the recognition that, while an animal can excel in one ‘event,’ human athletes can excel in all, aerobic as well as those where length or height or strength is the basis of achievement. Now the Olympics are upon us. Unlike animals, who compete for food, water, shelter, and safety, Olympic athletes compete for status and for being the best in their event. And in that regard, the athletes of today are facing some challenges that did not exist twenty or thirty years ago. Recent analysis of all of the Olympic records set between 1896 and 2016 has lead researchers to believe that Olympic athletes can expect fewer opportunities to set new records in the future. These data show that the pace at which sports records are being set has slowed, and might have even plateaued during the 1980s. In addition, records that are being set are happening in smaller increments. As an example: in the 2014 Olympics, Joseph Schooling bested record holder Michael Phelps in the butterfly event by a mere two tenths of a second. Can an athlete feel pride and accomplishment by overtaking a world record by two tenths of a second? Or muster up the courage and dedication to train for such a small margin of gain? Can the loser avoid cynicism and disillusionment? Then there are big questions which have arisen from all the number crunching: Is there a finite level of physiological capacity, both for humans and animals? Are Olympic athletes at the end point of skill building? In his research, biologist Mark Denny asked those questions regarding speed in race horses, greyhounds, and humans, all having been trained to run. Horses and dogs had been racing competitively for centuries. Humans, for millennia. In dogs and horses Denny identified limits to the speed they were able to cover over a given distance. Also, even when an intensive program to enhance performance was initiated, race speeds in horses and dogs have not increased in the last forty to sixty years. These animals appear to have reached their limit. In humans, the analysis of the hundred-year historical data suggests that a limit exists, and that the speed is only a few percent greater than observed to date. But Denny claims that humans have not reached a plateau in running speeds. Which brings me to my conclusion. Humans and animals, and animals and animals, must not be compared for evidence of superiority of one or the other species. All are a part of one family and, like all families, there are differences among its members. Yet, each brings something valuable to the mix. Each adds to the whole. Please enjoy this video that looks at the connection between humans and animals. The coffee shop. A self-contained environment with its distinct soundscape. The whirr of a blender. The hiss of a cappuccino machine. Music playing in the background, not too soft, not too loud, just right. All the muted and not-so-muted conversations. An occasional cough or giggle. A chair being dragged along the floor. This mixture of sounds happens within the coffee shop, where people flock for stimulation or to get out of the boredom or loneliness of working at home. Some are looking for anonymity and separation, but not aloneness. The constant hum is comforting for its familiarity and lack of surprises. Out-of-place noises, like people arguing or a mother scolding a child, can cause discomfort. It’s not a part of the natural way of the healthy coffee shop. As I described in my blog post on soundscapes, in nature all the inhabitants of a healthy habitat create their own sonic territories – called niches – where they can hear each other unimpeded by their neighbors’ voices. It appears that those who inhabit coffee shops have created their own version of sonic territories. Ear phones and ear buds, cell phones and computers, these help maintain the separateness amid all the sound. Small tables allow for intimate conversations. Not only can people hear each other unimpeded in the soundscape of the coffee shop, but as research has shown, the ambient sound of a coffee shop may be at just the right level – around 70 decibels – for maximizing the possibilities for creative thinking. Maybe that would explain why the chat you are having with a friend may seem more interesting than it would if you were standing on a street corner. Or maybe you feel you are more interesting. Maybe your friend is more interested in the conversation than she would be sitting at your kitchen table with a cup of tea and a slab of homemade zucchini bread. Maybe that business idea you are proposing sounds more appealing to the potential investor. If that’s the case, and if indeed the ambient sound of the coffee shop has the effect of enhancing creativity, it will come as no surprise to learn that some very clever entrepreneurial types have latched on to the research findings. They have created soundscapes of, not only the typical coffee shop, but have come up with a repertoire of sounds that can be downloaded and mixed and matched for escape into one’s own self-designed soundscape. For those who love ambient noise, maybe rain would be their choice. Or thunder. Or leaves blowing. Or any combination of the many choices offered by websites such as Coffitivity or Nosili, a couple of the popular companies that produce recorded sounds. Think of how creative you can be creating soundscapes. I wonder if Carl Jung, the Swiss psychiatrist and founder of analytical psychology, would support what seems like an unnatural and artificial way of evoking our creativity. He was concerned about the negative effect on our mental health and on our psyche of gadgetry that separates us more and more from the natural world. Jung taught that the unconscious, the source of creativity, works with our intuition to creatively solve problems outside of our awareness. Can a recording of a cappuccino machine tap into that part of the psyche? Can a simulation of rain falling or a bird calling do that? Café Restaurant and Coffitility are two companies that have developed their product around the findings in the research study I mentioned above. The article is often cited in the literature about the digital world and was featured in the New York Times, the Wall Street Journal and the Huffington Post. The study was published in the Journal of Consumer Research, and appears to have been carried out rigorously. The researchers examined ambient noise and how it affects creativity. With five experiments, they were able to demonstrate that their hypothesis that a moderate 70 decibels of ambient sound – as opposed to a low 50 decibels or a high over 80 decibels – enhances performance on creative tasks. But a second part of their hypothesis is that such a condition would increase buying likelihood of innovative products. Excuse me if I end right here. In the end it’s all about buy, buy, buy. I spent four days becoming acquainted with a robin. It all began when the poor creature slammed into my living room window and dropped to the ground, unconscious. I picked up the panting bird and carried him into the house, where I left him in a spare bedroom in a box with a container of water and bird seed I had run out and purchased from the local hardware store. Like the city girl I was at the time – a recent transplant from Los Angeles to the Sierra foothills – I assumed he would eventually wake up, eat and drink, get well and happily fly off. When I returned to the room an hour later I was pleased to see he was awake, but he had shown no interest in either the water or the seed. And as I approached the box, he became agitated and made awkward movements as if trying to escape. But he could not fly. One wing and one leg appeared to be injured. It was then that I saw him, really saw him, for the first time. Not as a robin, but as a being in distress in a strange and unfamiliar environment. Then, almost as an instinct, I began to console him, to talk to him quietly, trying to soothe him. I reached out with one finger and rubbed his head gently. These actions seemed to come so naturally. And whatever I was doing appeared to have a positive effect. Somehow I had gained his trust, and he stopped struggling. I picked him up and felt along his body, along his wings, and his legs, all the time I talked to him, gently, telling him he was going to be all right. I can still feel his warm, silken body, relaxed and calm, his little heart beating rapidly in my hand. The robin would stay with me for four days. Each day I held him and talked to him. Each day he became stronger and livelier. Eventually I took him out of the box and he began to move about. It was on the third day that I found him sitting up on the windowsill looking outside. Apparently he had gained the ability to fly. The water and birdseed remained untouched. Since I assumed he was getting ready to leave, I removed the window screen and left him sitting on the sill. When I came back several minutes later, to my surprise, he was still there. My robin – yes, MY robin – would spend one more day with me, flying back and forth from the floor to the window sill. On the fourth day, when I entered the room, he was gone. I looked out the window and there he was, sitting on the limb of a cedar tree. He sat and looked in my direction for a few moments, and then he flew away. For several days I looked out at the cedar tree, but the robin did not return. As I’ve thought back on the experience, I realize it was only after I engaged emotionally with the robin that I was able to reach out and to assist him. Something did pass between us, something more than a sincere look, or even a calming voice or a light touch could explain. Primatologist Frans De Waal, author of The Age of Empathy: Nature’s Lessons for a Kinder Society, focuses his research on emotions in animals. According to De Waal, giving consolation is an outcome of empathy. His book contains many examples of animals engaged in empathic and consoling behaviors. Perhaps my empathic feelings towards the robin prompted me to console him. Perhaps this created an emotional linkage between us, a universal sharing of feeling that set up the bond of trust that was able to last four days.